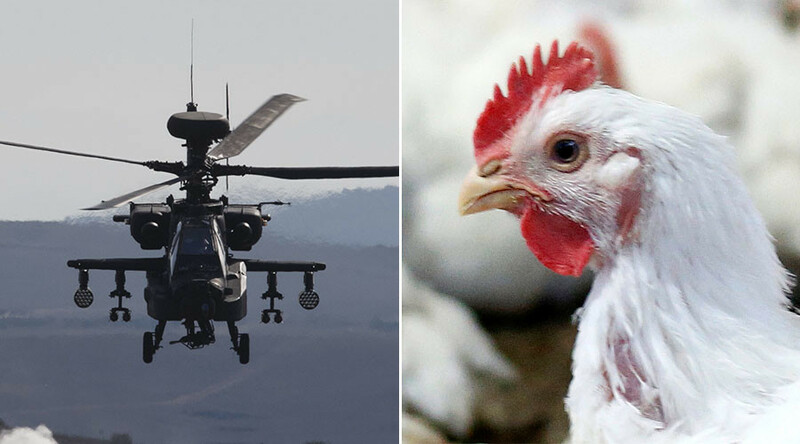 The Ministry of Defense (MoD) has been forced to make payouts 18 times in the last three years to compensation farmers for the death of their chickens, which trampled each other to death when startled by low-flying military aircraft. The farmers allege the low flying aircraft, which include Apache and Chinook helicopters, as well as Tornado jets, left the surviving chickens so traumatized they stopped laying eggs. It is thought that most of the deaths occurred as a result of Royal Air Force (RAF) and army aircraft exercises simulating low-level flying in battlefield conditions, according to the Mirror. The biggest payout, which went to a farm in East Sussex whose birds fell fowl of a Chinook, was for £79,041 ($98,780). Farms in East Anglia, Wales, and Northern Ireland have also received payouts, along with a number in Hampshire, Somerset, Devon, Oxfordshire, and Cornwall. “Low flying aircraft can cause the birds to ‘smother’ in a panic reaction,” a spokesperson for the British Egg Industry Council told the Mirror. Smothering is when the hens pile on top of each other in a blind panic, which can cause hundreds of suffocation deaths in large flocks. The spokesman also said another result of the “stress of the shock” is that the birds stop laying and then produce only “poor-shelled” eggs unfit for sale to households. “The farmer’s losses amount to the value of the birds which die, the consequential loss arising from the flock being smaller than it otherwise would have been, and the reduced egg value from the remaining hens due to both lower egg numbers and higher levels of second quality eggs,” he said. The Mirror’s investigation also revealed that the MoD paid out £1.6 million ($2mn) for damage to cows, sheep, horses, and people over the last year. Other property damage costs include £780 ($975) for a Lincolnshire chandelier and £3,000 ($3,750) for damage to tents in Wales. Past payments have been made to a therapy group whose tranquility was disturbed by the unexpected appearance of a combat aircraft, and to the owner of a parrot whose legs were broken after an overflight sent it into a panic. “We take the issue of safe low flying extremely seriously and understands [sic] that military low flying can be noisy and unpopular but it is an essential part of operational training,” the MoD told the Mirror. 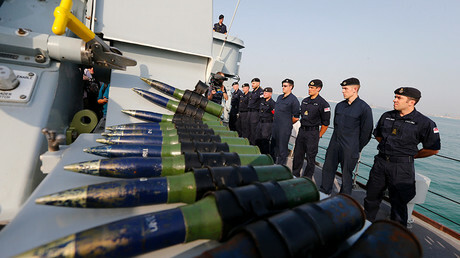 “The MOD will pay fair and reasonable compensation on an ex gratia basis, without admission of liability, subject to the provision of supporting evidence of loss,” the department added.